SEATTLE - It was the same tired story for the Red Sox. The same tired story for Jon Lester. His brilliance has waned as his ERA has waxed. After proclaiming early and often that it was just one pitch, or one hit, that undid his outings, the frustration bubbled over for him last night. He seemed disgusted at his season, every word jumping in annoyance out of his mouth. He had lost again, this time cowed by two home runs from a singles hitter, as an Sox early lead became a late deficit. With the West Coast becoming a danger zone for the Sox (3-7, with two games left on the trip), the team lost another game to another anonymous pitcher, this time Chris Jakubauskas, who entered with a 7.67 ERA, and left with a 5-4 win over the Sox at Safeco Field. "It [stinks]," Lester said of his season. "I really don't know what to say, other than it's been [expletive]. I bust my [behind] every five days to go out and perform and I'm not performing right now. I'm letting the team down. There's no reason that we should not have won that game after four runs in the first three innings. It's just inexcusable. "But with that being said I can promise you that there hasn't been a pitcher that has worked harder than I have from the beginning of this season, and there won't be a pitcher for the remainder of the season that will work as hard as I will to get back to where I have been in the past. I don't think we're far. I think it's just little things right now that are screwing up my outings. Hopefully - no, not hopefully - it will turn around. It will turn around here in the future for not only me, but the team." Instead of their struggles in the West abating last night, as it seemed it might with the Sox rushing out to a 4-0 lead, base runners and the struggles finally caught up with Lester. 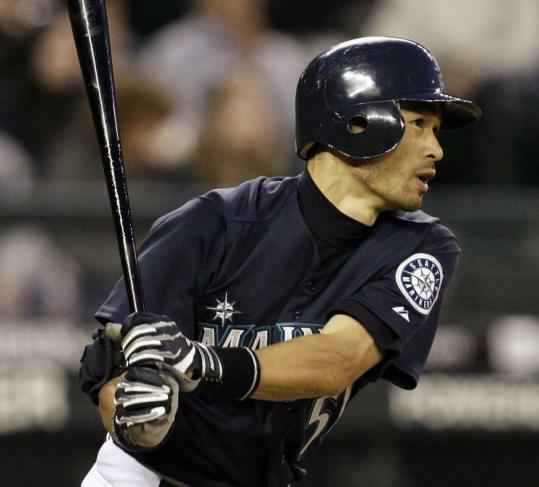 The Mariners - owners of a sub-.500 record - took the first game of this series as Ichiro Suzuki did a couple of very un-Ichiro-like things. He hit two home runs, both off Lester. No matter he had been just 2 for 10 coming into the game against the lefthander. No matter he had just 75 homers in 5,581 career at-bats. His home runs were the difference in front of 34,952, who booed when Ichiro was belatedly given an intentional walk in the eighth inning. Lester said, with his disappointment and frustration evident, that it was two fastballs down the middle that Ichiro hit out of the ballpark. His fault. "He left a fastball to Ichiro," said manager Terry Francona, who said he did not consider replacing Lester after a Franklin Gutierrez single that preceded Ichiro's second homer. "That's the reason we left him in, so it didn't happen, and it happened." Lester (2-4) allowed five runs in 5 2/3 innings, exploding his ERA to 6.51, and helping to continue an ignominious statistic: Among the five highest ERAs for qualifying starting pitchers in the American League, three are Red Sox (Brad Penny, Josh Beckett, and Lester). But it was a defensive play that got Lester the most. On the comebacker in the sixth inning, Julio Lugo had the responsibility to cover second base. But with the ball coming on the shortstop side of the mound, second baseman Dustin Pedroia covered the base. Lester, though, couldn't adjust to the new face on the bag. "I screwed the play up," Lester said. "I turned around, expecting Lugo to be there, and he wasn't, because he was coming in to get the ball. For some reason it screwed me up. I don't know why. We work on that play 100 times in spring training to prepare for situations like that. I basically just screwed the whole play up. I throw the ball to second, we get a double play, it's a completely different ballgame." The Sox had their chances, though. Chances they couldn't convert but should have converted. As they had in Saturday night's game against the Angels' Matt Palmer, the Sox dried up after the third. Last night, the Sox scored one run in the first, another in the second, and two more in the third. After that, the team had no more than one base runner in each inning. Only Jacoby Ellsbury - on a single and a wild pitch - made it to second after the third inning. "We didn't add on," Francona said. "We paid the price for it. We had [Jakubauskas] on the ropes, we had a chance. We came out swinging. We actually came out with great energy after a tough game yesterday. Give [the Mariners] credit, they came back." Ellsbury had been making his way around the bases, putting on a show for the hometown folks up from Madras, Ore. By the fourth inning, by which time the center fielder had three at-bats, he was three-quarters of the way to the cycle. Ellsbury doubled to the warning track in left-center to open the game, scoring the first run for the Sox. He tripled to right-center in the second inning but was stranded, and he had an infield single in the fourth. The home run was the difficult one to get for a player with quite a bit of speed but not a lot of pop. Ellsbury has just 13 career home runs in 815 at-bats. He flied to center in the sixth, and grounded to first in the ninth. But it looked as if another Red Sox might have had the pop. With J.D. Drew reaching on a single, Jason Bay - hero of heroes this season - stood at the plate in the ninth. He blasted a pitch from David Aardsma to left field, nearly stopping a few hearts in the visitors' dugout, a home run a potential game-winner. But Wladimir Balentien caught it deep on the warning track and that was it. "I thought it was out," Pedroia said. "But this ballpark, the ball doesn't travel that well. There's no cheap ones here."